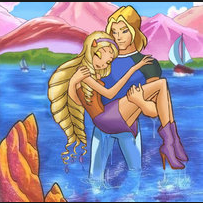 Winx Club: Sky and Diaspro. This is Winx Club Sky and Diaspro Fanart.. Wallpaper and background images in the Winx Club club tagged: photo winx club fan art prince sky princess diaspro. This Winx Club fan art contains anime, comic kitabu, manga, cartoon, and mkono.